A contact from the Emmaus group in the UK recently returned to Bethlehem to assess any changes in the status of the Christian community there. Below is part 1 of his report. Since my last visit in 2012 there have been some notable changes. An overwhelming sense of fear and anticipation now pervades the Christian community, fuelled by their belief there is little they can do to change anything. They are now a minority representing just 4.8% of the population living among a Moslem majority of 95.2%, with a fragile constitution built on Sharia that affords them less rights or equality. It would be unfair to say they have given up hope, but there is a growing sense of hopelessness. Palestinian society as a whole seems to be deteriorating with increasing levels of debt, violence, discrimination and lack of interest in even trying to explore ways forward with the Israel. Many are just too tired and weary. Fear was present in most conversations as was anger. There is deep frustration with the Palestinian Authority who, in their opinion, has failed them completely. Basic infrastructures are absent or of poor quality with no credible law and order, health service, social services or education. This is despite the vast amounts of aid flowing in over twenty years. While I was there, three days of shootings occurred with gunfights in the street at night, and a police officer killed. Hospitals and medical facilities are avoided for fear of catching disease and government schools are seen as incubators of radicalism. It is unsafe for Christian women to walk in parts of some cities and although not a new phenomenon, the areas in which women will now not walk has widened. Kidnapping is a growing concern, exacerbated by the very recent attempt to take two young female Christian schoolteachers on their way to work. Christian schoolchildren will not travel in taxis unless the driver is a Christian and known personally to the family. There are rumours (unconfirmed) of young children being kidnaped in Beit Sahour, a neighbouring town to Bethlehem, for the harvesting of body organs. Even school Facebook pages are warning parents to be vigilant. It is believed that Beit Sahour is being targeted because it has a higher proportion of Christians. Unilateral refusal adopted by the Bedouin sector in relation to any generous offer from the government over the years is in fact a bargaining chip of the Bedouin position, which refuses any compromise and creates “facts on the ground.” For the sake of discussion, they claim that the percentage of lands needed for settling the Bedouin population is only 3% of the area of the Negev (around 86,487 acres), and the amount of land claims amounts to “only” five percent (about 160,618 acres) from the total area of the Negev, which comprises some 3,212,400 acres. The aerial photographs printed above in regards to the section dealing with the number of Bedouin villages in scattered areas gives tangible evidence to the great spread of Bedouin settlement. The investigative division of Regavim has made an updated map of settlement, showing this spread covers 148,263 acres, as will be expanded upon in the following sections. 1. 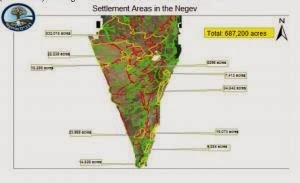 The True Extent of Lands used for Bedouin settlement is about a fifth (20%) of the Negev. After taking away the firing ranges used by the IDF, the nature reserves and the areas protected by the National Master Plan (Plan 35), the remaining lands reserved for settlement of the Negev amounts to only 687,200 acres. It should be emphasized that the settlement areas are not actually ever fully used for settlement and agriculture, but also include parks, open areas and the like. As such, the numbers have a completely different meaning: The Bedouin 148,263 acres actually occupy 21.5% of the lands allotted for settlement throughout the Negev, and make claims on a similar amount of land. For the sake of comparison: There are 205,000 residents in the city of Be’er Sheva living on only 8,650 acres of land. The Bedouin population, numbering at around 211,000 people, live on an area seventeen times larger, on around 148,260 acres of land! 2. Percentage of Lands Claimed: All ownership claims over lands that have come to the courts since the 70’s until today, whether initiated by the Bedouin or in the context of opposing claims filed by the State of Israel in the past ten years, have been shelved. The State of Israel has declared over the years that according to the law and according to the registry, it is the owner of the scattered areas of the Negev and it is willing to clarify all claims of ownership of the Bedouin in court. Among the Bedouin population, only 12% (300 families) are categorized as claimants over various areas of land. In other words: 300 families (approximately 13,000 people) are claiming private ownership over 23% of the Negev that is reserved for settlement! In order not to leave an opening for the Bedouin claim that also individual farms and agricultural settlements in the Negev receive vast lands; it should be mentioned that this claim is NOT genuine. The farms in this region are placed there as guardians over government land and live under a tenant agreement. None of them make ownership claims over the lands they work and none of them expect to receive the land as private land. The true extent of land where the Bedouin live, where they make claims of private ownership, is not only 5% of the area of the Negev, but rather 23% of the area of the Negev that has been allotted for settlement. Some 20-30% of Bedouin in the Negev have seized lands more than 17 times the size of the city of Be’er Sheva. 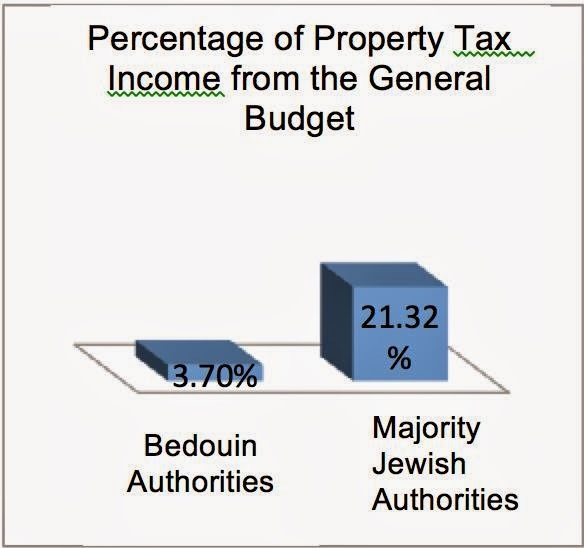 Whose total number of residents is approximately equal to the total population of the Bedouin in the Negev. Among all of the sectors of Israeli society, there is no sector so small that makes a claim of private ownership over an area so large, despite the fact that from a legal perspective, it has been proven time and time again that their claims are without basis. 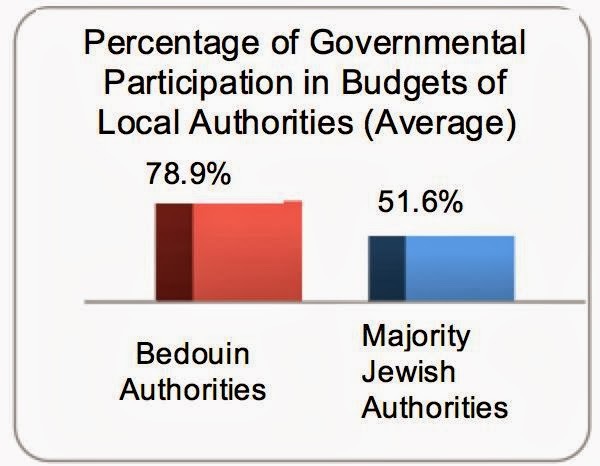 BEDOUIN MYTH #5 – GOVERNMENT BUDGETS DISCRIMINATE? 3. Property Tax Payments to Local Authorities. said goodbye to Rambam and the people who cared for her and her twins. Pregnant women in Gaza rarely need to turn to Israel for medical help since medical care is available in Gaza before and throughout their pregnancies. It is even rarer that two women from Gaza, within weeks of each other, find themselves and their unborn child facing life-threatening problems necessitating the expertise of specialists at Rambam Health Care Campus - but that is what happened. antibodies harming the red blood cells of the fetus. However, in “A”’s case, the problem was not detected in time - she was in critical condition and both she and her unborn child were in danger. Two days after being admitted, “A” gave birth. However, things became even more difficult when her premature son was found to also have a congenital heart problem. “A” had two small children waiting for her back in Gaza. One week after his birth, “A” had to make the difficult choice of returning to Gaza to care for her children. Her premature son remained in the care of Rambam’s medical staff. condition: patent ductus arteriosus (PDA), in which a vessel in the heart does not close. The infant is gaining strength and his mother remains in contact by phone on a daily basis until she can return to Rambam and bring him home with her. Just before “A” arrived at Rambam, "H", a 35 year-old woman in her ninth month, was brought to Rambam from Gaza - also in extremely critical condition. Carrying twins, her condition was so serious that she was barely aware of her surroundings. Since childhood she had suffered from a blood clot disorder. Now that disorder placed her in extreme danger of bleeding to death - she needed special care and medications not available in Gaza. Upon arrival “H” underwent a C-section to save her first children - a healthy boy and girl - each weighing 2.3 kg. However “H” remained in critical condition and was sent to the intensive care unit (ICU). It would be two full days before she was alert enough to ask about her babies. Each day the medical staff took new photos of the infants so that she could have a record of their first days once she recovered. After one week in the ICU “H” saw her children for the first time. “I still remember when I left from Gaza to come to Israel,” “H” explained. For “H,” the birth of her twins has been a great comfort. A few days ago, two-and-a-half weeks after arriving at Rambam between life and death, “H” said goodbye to Rambam and the people who cared for her. It would seem that there is a political game being played between UNWRA and HAMAS and the headline "Hamas blocks UN textbooks in Gaza" is all part of this game. As David Bediun writes http://www.israelbehindthenews.com/bin/content.cgi?ID=7150&q=1 , there are false rumours about the UNWRA curriculum content. David's article should be read in its entirety. I strongly suggest to treat this story with serious caution. Hamas blocks UN textbooks in Gaza because they focus too much on ‘peaceful’ conflict resolution. Gaza’s Hamas authorities have blocked a UN refugee agency from introducing textbooks promoting human rights into local schools, saying it ignores Palestinian cultural mores and focuses too heavily on "peaceful" means of conflict resolution. Motesem al-Minawi, spokesman for the Hamas-run Education Ministry, said that the government believes the curriculum does not match the "ideology and philosophy" of the local population. He said the textbooks, used in grades 7 through 9, did not sufficiently address Palestinian suffering and did not acknowledge their right to battle Israel. "There is a tremendous focus on the peaceful resistance as the only tool to achieve freedom and independence," he said. Hamas, which has killed hundreds of Israelis in suicide bombings and other attacks, says that armed resistance is a key component of its struggle against Israel. The group also objected to the books’ inclusion of the Universal Declaration of Human Rights - a document approved by the UN General Assembly in 1948 that recognizes the equal and inalienable rights of all members of the human family. Hamas believes that certain parts of the declaration violate Islamic law, including the right of people of different faiths to marry and the right to change one’s religion. Al-Minawi said government officials had met with UNRWA officials and offered to form a joint committee to revise the book. Adnan Abu Hassna, a local UNRWA spokesman, confirmed that the curriculum had been suspended while the sides work out their differences. The spat is just the latest in a line of disagreements between Hamas and UNRWA. The United Nations Relief and Works Agency, known as UNRWA, assists Palestinian refugees and their descendants throughout the region. In Gaza, the agency runs some 245 schools serving more than 232,000 students plus dozens of medical clinics and it distributes food to many of the territory’s 1.7 million residents. But Hamas has frequently squabbled with UNRWA in a rivalry for the hearts and minds of Gaza’s people. Hamas has pressed the UN not to organize mixed folkloric dancing for boys and girls; to keep Holocaust education out of its curriculum and it has used harsh rhetoric against previous senior UN officials. Last year, UNRWA cancelled its annual Gaza marathon after Hamas banned women from participating. Israel has denied entry permits to some 50 Palestinian medical patients from the Gaza Strip because the words "State of Palestine" appears on the letterhead of their application, officials said on Wednesday. Israel does not recognize a Palestinian state, whose creation it says should stem from peace negotiations. It voted against a U.N. General Assembly resolution in 2012 that gave de facto recognition to a sovereign Palestinian state. "On Sunday (the Palestinians) filed a range of requests ... on a document that said 'State of Palestine'. On the spot, we returned it to them, saying they should refile the request on appropriate paperwork," said Major Guy Inbar, a spokesman for COGAT, the military-run authority that handles entry permits. He said 10 Palestinians whose cases were urgent were allowed to enter Israel while about 50 others were not. Israeli treatment for patients from the Gaza Strip - an enclave run by Hamas Islamists hostile to Israel - is arranged by the Western-backed Palestinian Authority, which exercises limited self-rule in the occupied West Bank. Omar al-Naser of the Palestinian Health Ministry in the West Bank city of Ramallah said the ministry had been using the "State of Palestine" letterhead for a year without any move by Israel to deny patients entry. 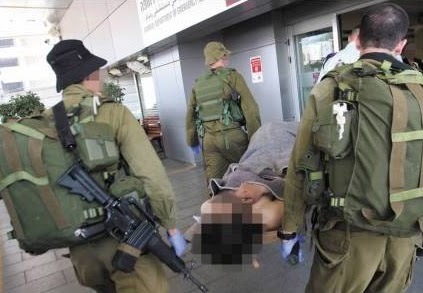 The ban affects ill people using the Erez Crossing and has been labelled by Palestinians as “rude, barbaric, illegal” and “aimed at killing patients” for whom treatment, as the Israelis know, is not available in Gaza. I spoke to the COGAT spokesperson for Gaza, and found out the real story. For several months, the Palestnian Authority has been sending requests on the new letterhead. Every single time, COGAT rejected it, and each time they were resubmitted with the Palestinian Authority letterhead - and approved. This was not new, and the PA knows very well that this was the case. As recently as Sunday, several patients whose requests were on the new stationery were rejected, and then the PA re-faxed the request the old way and they were approved. Existing agreements are between Israel and the PA, not the fictitious "State of Palestine." It is obvious that the PA is trying to embarrass Israel and will happily use Gaza patients as a means to do so. It is equally obvious that the "State of Palestine" is a final status issue, and that Israel cannot act otherwise without jeopardizing its negotiating position. As usual, instead of dealing with Israel directly, the PLO is passive aggressively using the media to demonize (and weaken) Israel on its behalf. And, as usual, the media is happy to play its part in this charade. This report was compiled during a visit to Bethlehem in December 2013. Howard is co-founder of the Emmaus Group and an internationally accredited negotiator and mediator in conflict resolution. This is despite the vast amounts of aid flowing in over twenty years. While I was there, three days of shootings occurred with gunfights in the street at night, and a police officer killed. Hospitals and medical facilities are avoided for fear of catching disease and government schools are seen as incubators of radicalism. growing concern, exacerbated by the very recent attempt to take two young female Christian schoolteachers on their way to work. Christian schoolchildren will not travel in taxis unless the driver is a Christian and known personally to the family. For the past three years, death has become a way of life for Syrian civilians, who are caught in the throes of a brutal civil war. 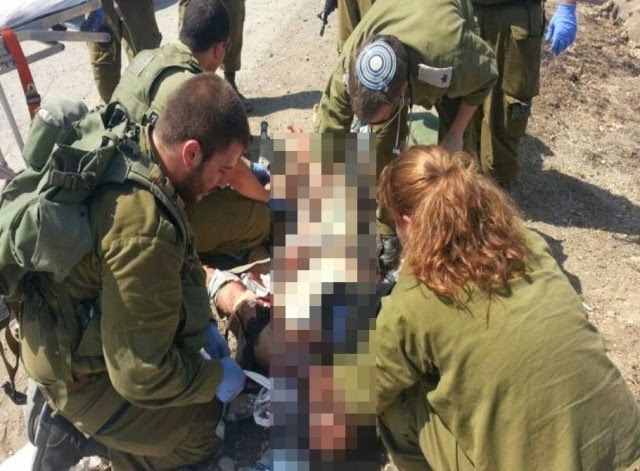 Last year, the IDF set up a field hospital to treat wounded Syrian civilians near the northern border. ase the psychological trauma of children, clowns visit the hospital on a regular basis, giving the young patients a chance to smile and laugh. Although this article is a year old, it is still so relevant with the incessant complaints against Israel that we are not doing enough for the "poor" Gazans. Never is a word written about the responsibility of the Hamas government to take care of its own citizens. The question is often posed: If their Arab and Muslim brothers around the region feel so strongly about the Palestinian people, why haven’t billions of dirhams, dinars, riyals, pounds or even rupees found their way into large-scale development projects aimed at alleviating poverty in the Gaza Strip? “But.. but… but… Israel!” the cry often comes. An argument that makes as little sense in theory as it does in practice. To get the facts straight from the outset is important, as misinformation propagated by the delegitimisers of the Jewish state often leads to erroneous beliefs being implanted in the minds of journalists, activists and, importantly, legislators. The Early Day Motion (below) states that “Israeli occupation policies” are to blame for the shortage of water in Gaza. In reality, the situation comes down to a number of factors that are not down to the “Israeli occupation”, a nonsensical reference to the state-of-affairs in Gaza that ended with Israeli withdrawal in 2005. Since Hamas took control of the Gaza strip and turned the area into a launching pad for its terrorist attacks against Israel, ordinary Gazans have suffered as Hamas continues to provoke Israeli responses through rocket-fire into civilian areas of Israel. In late 2012, Hamas targeted both Tel Aviv and Jerusalem, evidence that its goal is to cause as much human suffering as possible. And indeed it has. In Gaza, Hamas’s effective dictatorship over the strip means it is the authority responsible for infrastructure. Yet the aid it receives from international donors goes primarily into funding its terrorist activities. Supplies into Gaza are often, rightfully throttled to stop machine parts and materials that can be forged into weaponry getting in. This is not an ‘occupation policy’. It is a necessary defensive move taken by an embattled state in the throes of a prolonged conflict. The World Bank found that indeed it is the case that a lack of materials remains a pre-eminent factor in the Gazan water problem. While Israel, it claims, is guilty of overreaching in terms of the extract of water from the aquifers; the point has been conversely made that authorities in Gaza have done similar things, such as illegally drilling over 250 wells without authorization from the Israeli-Palestinian Joint Water Committee. Israel is no stranger to resourcefulness in this area, with government-sponsored innovations helping Israel to reduce its wastefulness and bring down the amount of water required per capita. 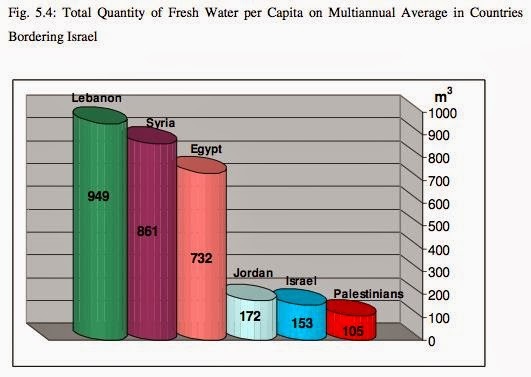 In reality, Israel consumes only a fraction more water than Gaza does, on a per capita basis. The subject of water was agreed upon under the terms of the Oslo Accords (part II) and Israel has not only fulfilled its obligations under the terms of that agreement, but actually supplies more water to Gaza and the West Bank than it is obliged to do. To repeat, for this is key, Israel has met all its obligations according to the Oslo Water Agreement, in terms of the additional quantities of water to the Palestinians, and has exceeded the requirements. Conversely, the Palestinians have breached two major areas of the agreement, specifically with relation to the digging of ‘pirate wells’ and in allowing wastewater to flow into streams untreated. That was their part of the bargain. Meanwhile, of course, while Gazans continue to require more and more water to fuel the growing population in the area, their brothers in Egypt are squandering gallons of it to close off tunnels that run between Egypt and Gaza, as has been reported today. The Muslim Brotherhood-run country has connected a well on their side of the border to rubber hoses which flood the tunnels. Of course, this is an attempt to crack down on illegal smuggling similar, though arguably harsher and more wasteful than the policies enacted by the Israeli government. One can’t help but wonder when the charges of ‘creating a prison camp’ and ‘oppressing the Palestinian people’ will be leveled at Egypt.